It might seem improbable – or even impossible – but for some people, discovering they have asthma comes later in life than one might expect. While many asthma sufferers are diagnosed in childhood, perhaps after being observed by an eagle-eyed parent or teacher, people who have less severe cases of asthma or irregular appointments with a primary care physician, can end up with a diagnosis much later in life. Prior to this diagnosis, their asthma simply presents as some other, more innocuous condition: allergies, a stubborn cough or being winded due to poor fitness. Even in people not genetically predisposed to asthma, it can develop after particularly nasty respiratory infections. CNN highlights the story of Laura Finlayson, 40, who couldn’t seem to shake her persistent cough. It lingered for months and became so violent she ended up in the ER with bruised ribs. After developing pneumonia, she failed to recover completely; doctors loaded her up with antibiotics, but nothing improved. Her symptoms lasted through several seasons and many months, yet the coughing never abated. Finlayson finally booked an appointment with a pulmonologist, who gave her a lung function test. He then told her that her asthma was completely out of control. Almost 2 million Americans are rushed to the ER each year due to asthma attacks. The problem is that all too often people miss the signs because they don’t realize asthma can develop well into adulthood. And over 80% of asthma patients suffer from what’s called allergic asthma – triggered by things like pollen, dust mites, pet dander, and certain foods. Alessandra Rodrigues, 34, went to her doctor with complaints of nasal symptoms: runny nose, congestion, post-nasal drip, and cough. She also reported that she’d developed wheezing and an inability to exercise – even an inability to walk up a hill. Think you might have adult-onset asthma? Although scientists and doctors are still uncertain what makes one person susceptible to asthma over another, specific factors have been determined to contribute toward a later-in-life asthma diagnosis. Female hormonal fluctuations. Some women first develop asthma symptoms during or after pregnancy, or following menopause, says Dr. Jonathan Parsons, MD, an associate professor of internal medicine and associate director of the Asthma Center at the Ohio State University Wexner Medical Center in Columbus. Suffering a bad illness. Viruses or lung infections can tip one into asthmatic territory, as can a bad case of the flu or a cold. Obesity. Overweight asthmatics seem to have more uncontrolled asthma and more days on medications for asthma. Allergies. According to the Asthma and Allergy Foundation of America, at least 30% of adult asthma cases are triggered by allergies. People allergic to cats may have an increased risk for developing adult onset asthma. Exposure to cigarette smoke, mold, dust, feather bedding, perfume or other substances may trigger the first asthma symptoms. What are the signs & symptoms of adult onset asthma? What can I do to manage my asthma? Check with your primary care physician to see what medication management is possible to help ease and prevent symptoms. Make lifestyle adjustments. If you smoke, quit smoking as soon as possible; if you’re subject to second-hand smoke, insist the smoker only smoke a safe distance away from your home. If you’re overweight and out of shape, losing weight and starting a low-intensity workout can help. 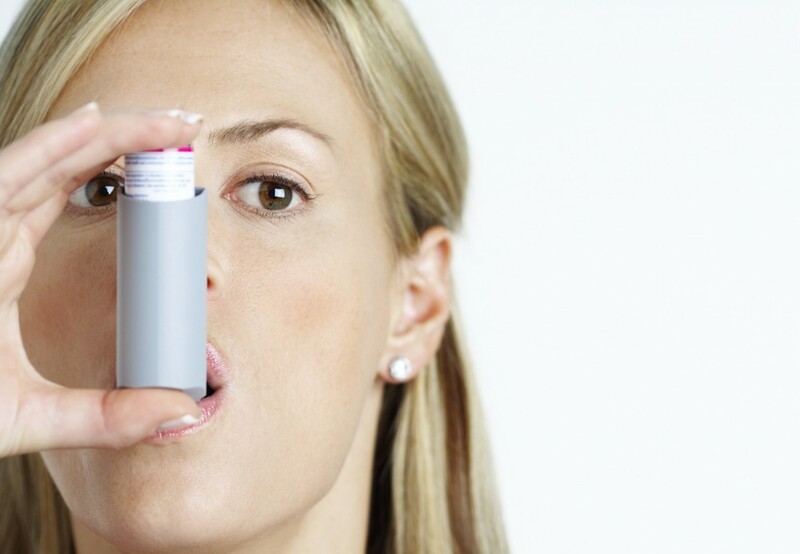 Avoid environmental factors that can worsen asthma symptoms as often as possible. Environmental factors such as pollution, sulfur dioxide, nitrogen oxide, ozone, cold temperatures, and high humidity are all known to trigger asthma in susceptible individuals. Avoiding outdoor activity on days when these factors are high can help. Treating your indoor air with a high-quality air purifier capable of eliminating triggers like dust, dust mites, dander, mold spores and mildew can also go a long way in providing relief. Thanks for this article. As a 41 year old who has been coughing for 2-3 years, this is inreresting and I havet JUST seen a pulmo FINALLY. My Dr always just made me feel like I was fake coughing. Gave me cough suppressants or antibiotics…. I get the asthma test in 2 weeks.